The Best ESL blogs from thousands of top ESL blogs in our index using search and social metrics. Data will be refreshed once a week. 2.47 So, You Think You Can Teach ESL? ESL Teacher newsletter is a comprehensive summary of the day's most important blog posts and news articles from the best ESL Teacher websites on the web, and delivered to your email inbox each morning. To subscribe, simply provide us with your email address. About Blog Your one-stop destination for English language programs, tools, products and resources. Facebook fans 137,562. Twitter followers 855,039. About Blog We're here to enrich language learning and make the experience more interactive. FluentU believes that online video is the ideal medium to study a language, and by delivering memorable, engaging content for users, we can offer the best online resource for studying languages. Facebook fans 9,119. Twitter followers 3,910. Los Angeles, California, USA About Blog ESLPod.com's English as a Second Language (ESL) Podcast is run by a team of experienced English as a Second Language professors with over 30 years of high school, adult, and university ESL teaching experience. This podcast aim is to make people learn English language. Facebook fans 61,367. Twitter followers 33,136. Cambridge, UK About Blog We provide award-winning English language resources, courses and services. Experience Better Learning with Cambridge, through thousands of insights, ideas and resources for language teachers. Facebook fans 146,651. Twitter followers 54,176. Oxford About Blog Welcome to Oxford University Press Blog. This blog is intended for teachers, trainers, lecturers, authors and anyone else with an interest in keeping up with what’s happening in the world of ELT and what we’re up to. We’ll bring you resources you can use in your classrooms, hints and tips for teaching, insights into the lives of publishers and authors. Facebook fans 255,746. Twitter followers 76,731. Montreal About Blog The Virtual Writing Tutor is an online grammar checker for second language learners. This blog is a collection of random articles about this website, about pedagogy, grammar, and about me. Facebook fans 1,375. Twitter followers 42. About Blog I am a regular virtual and face to face conference speaker and specialise in delivering learning technology training to help English language teachers exploit web based applications and resources. Facebook fans 13,682. Twitter followers n/a. About Blog Hi! I’m Cristina. I teach English to adults at the Official Language School ,which is a public centre dedicated to the teaching of languages to adults . I love teaching and have been doing so since 1991. Facebook fans 12,815. Twitter followers 1,133. Istanbul,Turkey About Blog I am a 30 year old English teacher, ELT author, freelance teacher trainer and educational consultant in teaching. Facebook fans 62,433. Twitter followers n/a. Costa Rica About Blog English Language Learning and Teaching. About Blog Online English teaching jobs and reviews. Find the job you want teaching online and reviews to help you with your employment decision. Facebook fans 910. Twitter followers 1. Ireland About Blog Keep up with articles from ELT Connect. Facebook fans 3,752. Twitter followers 335. About Blog ESL kids resources for English teachers. Printable lesson plans, flashcards, worksheets, classroom readers, songs, games, clip art images, crafts and more. Facebook fans 14,612. Twitter followers 174. Toronto, Canada About Blog Helping English learners move from the classroom into the real world. English Teacher Melanie is a TESL-certified English teacher who helps you find the best study tips and training techniques that work for you! Facebook fans 532,496. Twitter followers 8,585. About Blog Teaching ESL Online helps English teachers start their own thing online. Resources, advice, interviews, and tutorials give the online teacher everything he or she needs to become a success. Facebook fans 21,298. Twitter followers 1,456. About Blog Associate tutor in MA Applied Linguistics programme at Leicester University. My qualifications include B.Sc (Econ), M.A.TEFL (Distinction), Ph.D.
About Blog We offer the most varied listing of ESL teaching worldwide and training as well as resources for teachers to teach English worldwide. Facebook fans 2,880. Twitter followers 4,146. Brasilia, DF, Brazil About Blog Movie Segments to Assess Grammar Goals contains a series of movie segments and activities to assess or practice grammar points through fun, challenging exercises. Here you will find the movie segments, the lesson plans, printable worksheets with answer key for each activity, and the tips to develop your own grammar activities. About Blog ESLteacherEDU.org serves as a state-by-state guide that details the specific education, examination, and assessment requirements that each state’s Board of Education has established for qualifying teachers for TESOL certification. About Blog The best site for jobs, resources, and guidance related to ESL teaching. Our mission is to make teaching abroad as easy as possible. Facebook fans 334. Twitter followers 23. About Blog Whether you’re an ESL teacher or materials writer, I can help you reach more learners online. I know online ESL inside and out. Facebook fans 2,345. Twitter followers 206. About Blog Equipping ourselves because we love our learners! She has trained teachers and taught learners in over 25 countries and has consulted with organizations. Facebook fans 4,428. Twitter followers 79,693. About Blog Our site will help you obtain the necessary education to reach your professional goals. We provide links to accredited ESL degree programs in addition to other useful resources that cover a variety of topics related to the field. Facebook fans 1,838. Twitter followers n/a. Facebook fans n/a. Twitter followers 1,441. About Blog The ESL Commando is all about giving English learning students and teachers new ideas and opportunities for English learning and teaching. Facebook fans 925. Twitter followers 393. About Blog Discover fun ESL games and activities to use in your English language classroom. Read blog articles about teachers' experiences and TESOL tips for improving your classes. Find jobs teaching English abroad on ESL Expat's job board. Facebook fans 400. Twitter followers 2,345. Eastbourne About Blog This Page is dedicated for teachers of English as a second or foreign language and I share resources or ideas that you could use in class. Facebook fans 2,400. Twitter followers 4,307. About Blog TIps for Teaching English Abroad, ESL jobs, tefl and ESL speaking worksheets. Facebook fans 297. Twitter followers 266. About Blog Articles and tips for english teachers and students who are interested in learning always. Facebook fans n/a. Twitter followers 1,465. Cambridge & London, UK About Blog At ELTjam, we help people build digital products that deliver amazing language learning experiences. Follow this blog to find posts on ELT, digital product management, EdTech, new ways of working and more. Facebook fans 2,185. Twitter followers 5,470. About Blog I’m a freelance teacher trainer, and ELT course book author. This blog began as a place for teacher training resources and it’s all still there here but more recently it deals with more topics related to areas of interest, including the subjects of my conference talks and presentations. Facebook fans n/a. Twitter followers 2,081. 47. So, You Think You Can Teach ESL? Seoul, Republic of Korea About Blog An ESL, education, and teaching blog. To create fun, exciting and stimulating English learning materials for children all around the world! I am an ELL teacher in South Korea and have been teaching since 2009. About Blog Free materials, ideas and reflections for teachers of English by an ELT author and teacher trainer. Facebook fans n/a. Twitter followers 5,604. Madrid About Blog English Language learning videos. English Language Teaching, Bilingual ed, Literature. Facebook fans 4,494. Twitter followers 511. Brasil About Blog Richmond is based in Oxford (UK) and is now firmly established throughout Europe and the Americas. We research, edit, and publish ELT materials. Facebook fans 5,718. Twitter followers 615. Barcelona About Blog It is for teachers who want to help their learners become more effective listeners and speakers via great pronunciation teaching! It is for teachers who want to be able integrate pronunciation into every lesson! Facebook fans 445. Twitter followers 545.
mostly Seoul About Blog In this blog I am hoping to share and develop my thoughts about ELT and teacher development. Facebook fans n/a. Twitter followers 3,956. Bombay, India About Blog Ideas for creating immersive learning experiences. My ELT qualifications include the Cambridge CELTA & DELTA, and the British Council’s Professional Award in Teacher Development and Core Skills Validation. About Blog I’m an English language teacher who’s very interested in language acquisition and ELT methodology (which will be evident from the title of this blog!) Apart from teaching, I’m also involved in teacher development (in the company where I work I oversee professional development of a team of language trainers, and I also recently became a CELTA trainer). London/Glasgow About Blog Helps learners of English achieve great results with real focus. We strive to help learners succeed in English with authentic materials. Facebook fans 3,459. Twitter followers 1,728. Brasília About Blog This blog is about English Language Teaching and education in general. This is a place for me to express my opinions, have conversations with readers, and change my mind if that’s the case. Facebook fans n/a. Twitter followers 3,645. Facebook fans 272. Twitter followers 658. Facebook fans 1,525. Twitter followers n/a. About Blog Teach English: ESL is a reliable company that provides programs for Teaching English Abroad with dedication to excellence in quality for customer satisfaction. Facebook fans 3,180. Twitter followers n/a. Greece/UK About Blog This page is dedicated to my blog, My ELT Rambles. I enjoy blogging about teaching English and lifestyle. Facebook fans 719. Twitter followers 1,209. About Blog English Language Learners is a blog by Valentina. Facebook fans n/a. Twitter followers 3,753. UK About Blog A blog about the use of educational technology in language learning and teaching. Facebook fans 14,183. Twitter followers 16,852. Tucson, AZ About Blog Integrating language and content for academic success by English Language Learners. I love using my experience as an ESL Teacher, Teacher Trainer & Curriculum Designer to help you help your ELLs achieve success! Facebook fans 176. Twitter followers 188. About Blog Board games for learning and practising English. A blog about using table-top games to teach and learn English. About Blog I've been teaching in the public school system for over 12 years in Vancouver, Canada. I've taught English, Social Studies, Geography, Drama and ESL. I love my job and love creating unique and engaging activities for my students. Facebook fans 3,529. Twitter followers n/a. About Blog The purpose of ELT Research Bites is to present interesting and relevant language and education research in an easily digestible format. Facebook fans n/a. Twitter followers 703. About Blog I am a Teacher of English as a Foreign Language. This is my blog to contain my reflections on teaching, exciting things I learn, good (and BAD) lesson reports, material and generally my journey as a teacher. Facebook fans n/a. Twitter followers 1,091. About Blog We publish ELT books to support educational projects for children who have been displaced by war; we believe every child has a right to education. Facebook fans 1,235. Twitter followers n/a. Seattle, WA About Blog Reflecting on training, teaching, and learning on and around a 4-week ELT cert course. Facebook fans n/a. Twitter followers 2,051. About Blog A few words about teaching, language, and putting them together with technology. I am an ESL teacher at Santa Fe College in Gainesville, Florida. I enjoy messing around with technology in the classroom and in trying to become a better teacher. Japan About Blog We help English students learn Business English & become James Bond agents of amazing English skills to impress bosses, colleagues and friends. Facebook fans 20. Twitter followers 325. Edmonton, AB About Blog ESL teacher who loves to share ideas and teaching experiences. Bellingham, Washington. About Blog I’ve been teaching ESL and coordinating programs, doing teacher training and mentoring for over 35 years at colleges and universities in four countries including in Africa with the Peace Corps . I’ve co-authored nine textbooks, including the award-winning Conversation Strategies. I have an MAT from The School for International Training, in Brattleboro, Vermont. Currently, I’m a Coordinator and Academic ESL Instructor at Whatcom Community College, in Bellingham, Washington. About Blog Writing helps you solve problems. He shares his experiences about teaching. Halifax, Nova Scotia, Canada About Blog Teaching English to Speakers of Other Languages. Facebook fans n/a. Twitter followers 831. Windsor, Southern Ontario, Canada About Blog I am an Ontario Certified English Language Teacher (OCELT) in southwestern Ontario. My website is loaded with free materials for settlement English teachers. North West, England About Blog Free tips and advice, resources and thoughts on English language teaching and learning and academic writing. Facebook fans 68. Twitter followers 177. About Blog Wandering in (almost) Absolute Freedom the realm of ELT. UK About Blog ELT primary publishing specialist, published materials writer. Dublin City, Ireland About Blog Working to improve the working conditions and professional lives of English language teachers in Ireland through organisation and communication. About Blog A blog mostly about language teaching. I have been teaching English to adult learners since 1997. South Korea About Blog This Geeky Teacher is here to share my resources and ideas, and then a little bit more! There will be posts about ESL, Korea and many more. Facebook fans 31. Twitter followers 49. About Blog I’m Kieran Donaghy, a university teacher, teacher trainer and materials writer with over 25 years experience in English language teaching. Facebook fans 25,663. Twitter followers 5,145. About Blog Teaching English as a FOREIGN language to Deaf and Hard of Hearing Students. Facebook fans 62,436. Twitter followers 1,972. About Blog Our goal with What is ELT? is to help teachers, aspiring teachers and teacher educators with a quick reference guide of terminology, concepts and tools for the practice of English language teaching and professional development. Facebook fans 302. Twitter followers 2. About Blog An ELT teacher's thoughts. I am an ELT professional living and working in Dublin, Ireland. I’m interested in lots of different aspects of ELT and what you will see on this blog will hopefully reflect those interests. About Blog A teaching English blog for primary and secondary teachers. She is a teacher, primary ELT Specialist, teacher trainer and materials developer with 10 years experience in teaching field. Facebook fans 184. Twitter followers 6. About Blog A food-loving ESL Teacher who is learning about, and coming to terms, with technology. Belgrade, Serbia About Blog My English language teaching & learning adventure. Facebook fans n/a. Twitter followers 1,088. About Blog Reflecting on learning, teaching, & training teachers. About Blog This blog was created to share experiences and discuss ideas about how teachers can help learners practise English more outside class and learn more effectively in class, through taking a coaching approach in the classroom. We hope that the activities and ideas discussed here will be of practical use to teachers who want to see their students take steps towards independent learning. About Blog Dedicated to looking at language and language teaching from an evidence-based viewpoint. About Blog A blog of random thoughts on ELT, Web 2.0 tools, and about life in the beautiful region of Abruzzo. 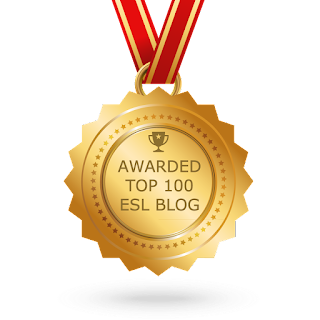 CONGRATULATIONS to every blogger that has made this Top ESL Blogs list! This is the most comprehensive list of best ESL blogs on the internet and I’m honoured to have you as part of this! I personally give you a high-five and want to thank you for your contribution to this world.